SIOS Protection Suite for Windows requires a unique license for each server. The license is a run-time license which means that you can install it without the license, but the license must be installed before you can successfully start and run SIOS Protection Suite for Windows. The final screen of the InstallShield installation utility displays the Host ID of your server. 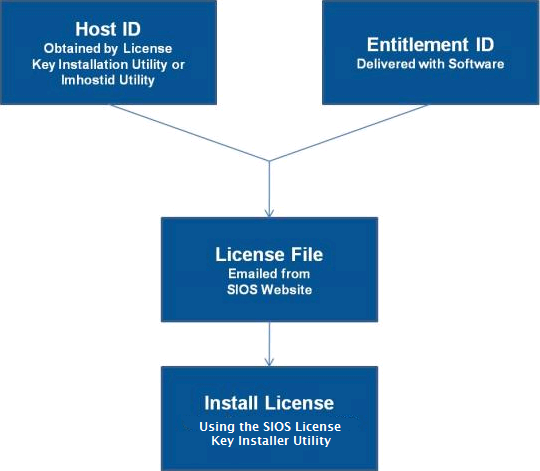 The Host ID, along with the Entitlement ID (Authorization Code) that was provided with your SIOS Protection Suite for Windows software is used to obtain the license. The process is illustrated below. View all licenses currently installed on your system. View all expiration notifications (days remaining) for each time-expiring license. Identify invalid licenses that are currently installed. Delete any installed licenses (right-click on the license and select Delete). Delete all expired licenses as a group (press the Delete Expired License button). Refresh the Installed License list when installing software or upgrades. Write the Host IDs in a notebook or save them in a file. If saved in a file, copy that file to a system with internet access. Otherwise, take your notebook with you to the system with internet access. Ensure you have your SPS for Windows Entitlement ID (Authorization Code). You should have received an email with your software containing the Entitlement ID needed to obtain the license. Obtain your licenses from the SIOS Technology Corp. Licensing Operations Portal. a. Using the system that has internet access, navigate to the SIOS Technology Corp. Licensing Operations Portal and log in entering your User Name and Password (or register if you do not already have an account). Note: New users must enter the Entitlement ID that is included in the delivery email..
b. From the Activation and Entitlements dropdown select List Entitlements. c. Check the box to the left of the product line item(s) that you wish to license. d. From the Action dropdown select Activate and enter the requested information (including your system HOSTNAME) then select Next. e Click on the Gray Plus Sign to choose an already defined host or create a new host by selecting the Green Plus Sign. f. Select ANY for the Node Locked Host choice if it is available, otherwise select ETHERNET MAC ADDRESS and enter the Host ID (MAC address), click OK then click Generate. g. Check the box to the left of the Fulfillment ID and select Complete. h. From the License Support dropdown select List Licenses. Check the box to the left of the Fulfillment ID and select Email from the View dropdown. i. Enter a valid email address to send the license to and select Send. k. Copy the file(s) to the appropriate system(s). On each system, copy the license key(s) to the C:\Windows\SysWOW64\LKLicense folder. Run the License Key Installer from the Start-Programs menu (Start-All Programs-SIOS-LifeKeeper-License Key Installer). Press the Install License File … button on the main screen of the License Key Installer. Browse to the location of the license file that you saved in Step 4 above. Click on the license file name. It will become highlighted. Press the Install License File … button that appears in that dialog box below the file names. A license detection confirmation popup will be displayed. Repeat on all additional servers. You must install a license on the other SIOS Protection Suite for Windows server(s) using the unique Host ID for each server. Restart SIOS Protection Suite for Windows. Review the error messages in the Windows Event Viewer. Verify credentials by logging in to the SIOS Technology Corp. Licensing Operations Portal. Enter User ID and Password. Run %ExtMirrBase%\lmSubscribe.exe again using the correct User ID and Password. If ownership of the license certificate has changed, please contact SIOS Technology Corp. Support personnel to have the certificate moved to the new owner. Once ownership has been moved, the automatic license renewal service will need to be updated with these new credentials by running the above command again using the new User ID and Password.